Is this Britain’s cheapest car? Feast your eyes, for a second, on this beauty. 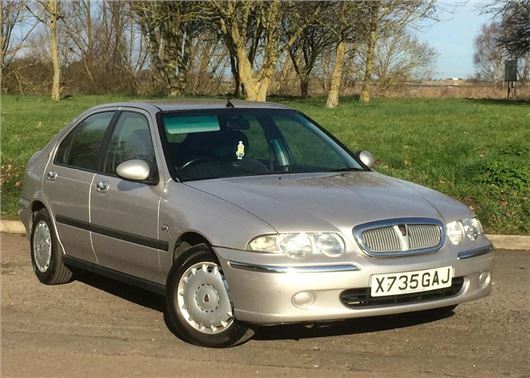 A fine piece of British automotive engineering, the car in question is a 2000 Rover 45 1.4iE, a base model, with keep-fit windows, a 1.4-litre engine, plastic wheel trims and no air conditioning. A desirable second hand car it isn’t. But what if we told you we’d bought it, fully road legal and MoT’d, for less than the price of a motorway service station coffee? At the princely sum of £3.19, we purchased a perfectly functional car for less than the cost of a tube ticket or most bus journeys. And apart from the fact it’s an old Rover with a cheapskate specification (and, if you’re on a budget, this isn’t always a bad thing, as it means less to go wrong), there’s hardly anything wrong with it. Indeed, it drives surprisingly well. Imagine my surprise, then, on waking up on Christmas Eve to find that I’d accidentally bought myself a present. It came about when idly browsing eBay a couple of days before Christmas. The Rover was listed as spares or repair, with poor photos and precious little detail. A quick online check revealed that X735 GAJ had a valid MoT through until August the following year, passed with no advisories. Surely, then, it couldn’t be that bad? By sending the seller a message, I was able to ascertain that the car had been running fine when parked up, but hadn’t turned a wheel in two months as the owner had bought something newer and more luxurious. Imagine my surprise, then, on waking up on Christmas Eve to find that I’d accidentally bought myself a present. My counterbid had raised the Rover’s value to £3.19 but beyond that there had been no more interest. Expecting to pick up a heap of scrap, when I went to collect the car after the festivities had finished, I was pleasantly surprised. Having sold the car for so little, the owner had simply filled out the V5 online and left the key in the glovebox while he went to work, leaving me (and my long suffering other half) to collect it from a village 40 miles away from home. The downsides? Well, it was filthy and for the first few miles of driving it, I did think it was destined to be a breaker - although it ran well, the heater was refusing to generate any warm air. Given the K-Series engine’s reputation for head gasket failure, my automatic mindset was to think the worst. It was also somewhat frustrating, as on a damp and cold day, the only way to see out of the blinking thing was to keep wiping the windscreen clear and drive with the window open. Two months on and there’s still plenty of life in the old dog. It has covered a shade over 77,000 miles, backed up by MoT history, it starts, stops and steers as it should and I’ve swapped one of the wheels over with the spare from one of my other cars, as it was borderline legal. Other than that, all it has needed is petrol. It’s presentable, too, now I’ve hacked all the moss out of the window channels, cleaned off the leaves and given the interior a thorough scrubbing. Indeed, it almost passes for presentable. So, what now for the 45? Well, at the moment, it’s serving a very noble purpose as occasional station transport, as well as being a dutiful second car for running errands locally. It’s perfectly pleasant to drive, in a simple sense and is surprisingly comfortable. Indeed, we’ve bonded and having rescued it from an almost certain death, my inner miser wants to eke as long a life out of it as I possibly can. So it’s staying indefinitely. Indeed, I’m that bloody minded that I may keep it going until it’s a classic. But why so cheap? Well, there are a number of factors at play. First up, people often don’t want to bother with selling cheap cars. The hassle of advertising, staying home and waiting for people to come round and kick the tyres can be a massive frustration. As, indeed, can selling the car via eBay or similar, where there’s no guarantee that a buyer will turn up. If it’s only worth £200 to £300 - and even in this kind of condition - it’s just not worth the hassle. Scrap is currently at an all-time low value globally, to the extent that breakers’ yards aren’t actually paying for scrap. And in some cases are charging to take it away. For cars like Rovers, 12 years defunct, there’s very little brand desirability. Great article but I would add that relative to its peers, they are great to drive. You don't get IRS on a new Astra or Megane but you do on these thanks to Honda. The sophisticated suspension gives great ride and handling and they rarely rust much. My 400 is 18 years old, has no rot and rides amazingly well. Very underrated cars, even if the door trim and headlining go all baggy! "You see dear wife, there is a bigger cheapskate out there than me"
I bought the "same car" but with a Honda badge & engine for £10K brand new but "old model" in 2000. It was great & sold at 100K miles with no repair bills apart from servicing, tyres, brake pads in the 5+ years of ownership. My DiL had the Rover sister car to the one featured - bought NEW in 2000 it was horrendous, poor reliability - engines, electrics, brakes, heater............ a money pit. Massive gamble buying the car without inspection. Worked out well but it is not an advisable strategy. Yes, that's right because once your name is down as registered owner ( plus your address ) the local council will come to you for towing and scrapping costs when it won't start for you ( maybe £300) or worse if someone sets fire to it meanwhile. £3.19 starts your liability not ends it ! I assume that the buyer does not live in an area where cheap, but functional cars, get torched! Well impressed, if it had beened a total wreck then who cares when it only cost pennies. Good for you and I'm delighted you're going to keep it. I always love a bargain and this will be very difficult to beat! Last car I bought for less than a tenner was in the very early '60s, My first car, a sit up-and-beg Ford Prefect. Used to cram 5 or 6 of us into it on Saturday nights out to the dance on Hastings pier. Cold, draughty, slow but never let us down and much better than being on our motorbikes that winter...Ah, memories! I'm a big believer in the under £500 car. They're often simple, without all that dreaded software to go wrong. It goes wrong in nice warm offices, let alone in a car where it gets hot, cold & damp. Bought a Wolseley 1500 for £8 in1968 from the friend of a girlfriend, who was in tears as it had failed its MOT. A pack of David's Isopon, chicken wire, screwed-up newspaper and a can of Dupli-Color soon sorted the hand-sized holes over the headlights and saw it sail through the test next day. Ran it for a year before sale to a scrapper for £35. The memory of that first car, with its character, leather, walnut and chrome led me, 16 years later, to start a classic car trimming business which I ran for 22 years. I'll never forget 7563 DT: keeping her on the road, against all the odds, taught me so much. Her salvaged white peak number plate is now on the garage wall next to a rare and exotic 1930s drophead. After you with the teabag, mate. or even six digit range. Hey-ho. Ho! ho!, Mr. Porter. In reality, the 8 quid for the Wolseley, plus 30 bob for the filler and paint, virtually cleared me out for the next 2 weeks until payday. No easy credit in the late 60s! Living on packs of Brain's faggots and powdered soup till the end of the month was not something I'd choose to repeat, but the great little car was worth it. cheapest car I ever bought, In Canada, for 1 penny, was a renault 5TS was going to be given it, but the indian owner said "I cannot GIVE it away, money must change hands" all I had was a penny in the ashtray, and so that's what i got it for.. 2 receipts in longhand as well .. never used it, sold it for 50 bucks. about to need too much money spending in it, in relation to it's market value. a continuing, long and happy relationship with your '45'. hospital of the first heart transplant fame was at the top. On maneuvering the car I stove in the near side wing on a lamp post. In England I had been used to driving as personal transport a J Type Morris van, this had the engine in the cab so no bonnet hence the accident. To my shame I told the dealer I no longer wanted the car and told him where it was parked. He just said right'o in his thick Afrikaans accent.